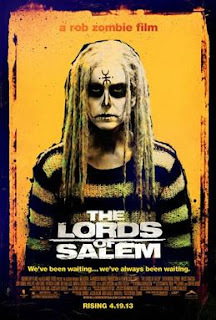 In Salem, Massachusetts, a recovering addict and radio DJ named Heidi (Sheri Moon Zombie) receives a strange delivery of a new record by an anonymous band calling themselves the Lords. The records has a strange, hypnotic effect on any woman who hears it, including Heidi. As her life appears to descend into a mess of demonic hallucinations, Heidi's fate appears linked to events centuries in the past when her ancestor prosecuted the original Salem witches. Rob Zombie's horror films fascinate me. He started his career - and indeed continues it - as a heavy metal musician, first as lead singer of the band White Zombie and subsequently as a solo artist. He was always a keen fan of horror cinema, so in 2003 it was not a huge surprise to see him try his hand at directing a horror movie himself: The House of 1,000 Corpses. From there's he's balanced his time between recording new music and directing more horror films including The Devil's Rejects, Halloween and Halloween II, The Haunted World of El Superbeasto and The Lords of Salem. The main reason I find myself transfixed by Zombie's screen works is because while they are generally not particularly great films they show a consistent and ongoing promise. He clearly knows his genre, and he has a very strong visual eye. There are individual elements in each of his films that I find to be extraordinary. As complete works, however, they never quite work. The potential remains, and with each film I hope he is going to finally knock a ball out of the park. Each time I am simultaneously fascinated and disappointed. The Lords of Salem has some extraordinarily bold imagery, much of which brings to mind the rotting, sexual aesthetic of genre mastermind Clive Barker. Parts of the film positively ooze with a sort of blood-soaked sensuality, not to mention striking moments of surrealism. He also straddles a provocative line between making a horror film that presents violence against women and making one that actively gives women the dominant roles - on both the heroic and villainous sides of the story. Sheri Moon Zombie is not the strongest actor in the world, but she plays a part that I suspect was tailored to her particular strengths. She does okay, but it is a somewhat limited portrayal. Much more interesting are some of the supporting players, including Meg Foster as a 17th century witch, and Patricia Quinn, Dee Wallace Stone and Judy Geeson as a trio of middle-aged women watching over Heidi from the apartment below. It is rare for a film to give a strong role to a woman over the age of 50. It is rarer still for a film to find strong roles for four of them. Foster in particular presents a stunning sense of menace. Bruce Davison is a welcome face in the film, playing local author and historian Francis Matthias. He meets Heidi once, during one of her radio broadcasts, but he continues to follow up on her story and background as the film goes on. While Heidi's experience is fairly abstract and subjective, Matthias acts as a more objective observer in the film, and provides most of the backstory and explanations that Zombie is willing for his audience to see. The story itself feels a little under-developed and weakly expressed. There are decent ideas in Zombie's screenplay, but they come across as slightly muddled. With a more considered script this could be a genuinely provocative and challenging horror film, but with the version Zombie uses it fails to completely satisfy. The first half of the film actually feels a little like a chore to sit through, but it is worth the effort as the second half is much more intriguing and enjoyable. It is the imagery, not to mention John 5's atmospheric musical score, that keeps The Lords of Salem interesting. It is just a pity that there is not a script and a story structure here to match. Once again Zombie presents a film rich with visuals and a great menacing atmosphere, but fails to properly pull it into an effective shape. Once again I am fascinated, but also a little disappointed. Crusade: "Ruling from the Tomb"
Star Trek: Deep Space Nine: "Accession"
Crusade: "Patterns of the Soul"
Doctor Who: "Guests of Madame Guillotine"
Star Trek: Deep Space Nine: "Bar Association"
Crusade: "The Path of Sorrows"
Doctor Who: "A Land of Fear"